Now, a little over a year later, Crystal City seems to be having a prime moment. On Monday night, the New York Times reported that tech giant Amazon was close to finalizing deals for its second headquarters, called HQ2 by the company, in Crystal City and Long Island City in New York. The Wall Street Journal had reported earlier in the day that Amazon was planning to split HQ2 evenly between two cities instead of choosing one as many people anticipated. This past weekend, before the HQ2 split came to light, the Journal and the Washington Post also revealed that Crystal City appeared to be an effective finalist for the headquarters, with anonymous sources telling the papers that Amazon was in advanced talks about potentially moving there. An official announcement by the company could happen in the coming days. Seattle-based Amazon will reportedly bring 25,000 jobs to one selected locality and 25,000 to the other, and the incentives that jurisdictions at first offered the company could change. While any deals are inked, here are five facts about Crystal City, maybe-future-home to HQ2. Technically, it’s not a city. The Arlington County government lists Crystal City as one of over a dozen neighborhoods within its purview. The name, according to the county, derives from that of an early residential building in the neighborhood, the Crystal House, which had a big crystal chandelier in its lobby. Other buildings in the previously industrial area followed suit. But it’s pretty walkable and transit-accessible. When taken together with Pentagon City to its north and Potomac Yard to its south, Crystal City and its immediate surroundings “form the largest walkable downtown in Virginia, rivaling the scale of other major U.S. downtowns like Indianapolis and Austin, Texas,” the Crystal City Business Improvement District explains. The neighborhood’s Metro station opened in 1977, followed a few years later by the Virginia Railway Express (VRE) station there. Also, Amazon workers could easily fly in/out of Reagan. JBG Smith is the primary landholder. Formed by a merger of JBG Cos. and Vornado Realty Trust last year, JBG Smith is the largest corporate developer in the region, and the biggest landlord to the federal government in the District. 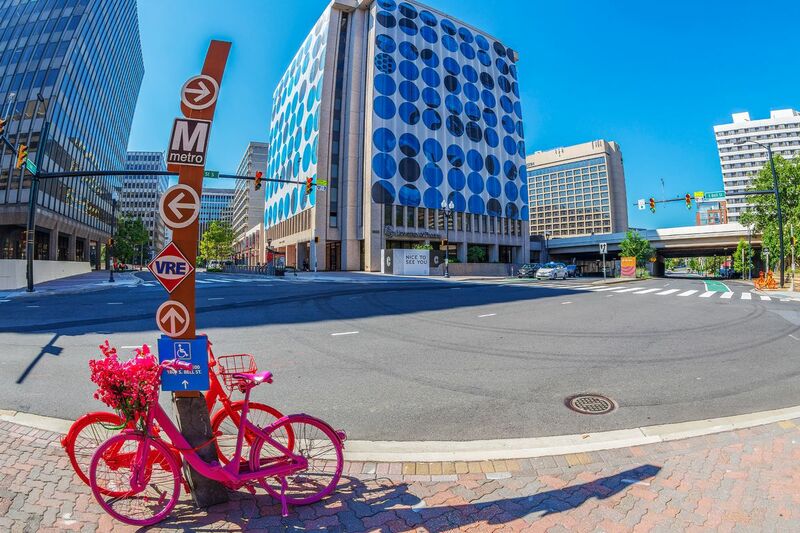 Transforming Crystal City has been a top priority for the company since it was established—a goal that includes recent place-making efforts like distributing painted bikes and painted flowers throughout the area as public art. JBG Smith now owns more than 7 million square feet of commercial property in Crystal City. The firm’s stock reached record levels after the reports of Amazon nearing an HQ2 decision. The office vacancy rate is still high. Roughly one-fifth of the office space in Crystal City was empty as of the third quarter of 2017, per data published by Arlington County. That rate put the neighborhood behind only Rosslyn, where one-quarter of office space was vacant. (The overall office vacancy rate for the D.C. area at the end of 2017 was around 14 percent.) Still, a significantly sized employer such as Amazon—and other employers who would follow the company’s new headquarters—could fill many of Crystal City’s offices. When it announced the HQ2 competition last year, Amazon said it would like to have up to 8 million square feet. It’s been compared to Brooklyn, a notion that launched a thousand takes on social media. It started with a simple enough proposition: “Think Brooklyn and Manhattan,” then-president of Vornado/Charles E. Smith Mitchell Schear told the New York Times in a 2016 piece about Crystal City. “You’re close enough, but you’re not paying higher taxes and utilities.” Twitter and Reddit lit up with opprobrium. Schear later told the Washington Post that it had to do with the “cool” factor—or at least his company’s aspirations for Crystal City to be hip—and the presence of a river, in this case Potomac. So, would HQ2 make the neighborhood more or less like Brooklyn? It may be the wrong New York City borough to be thinking about now.